How Can Mobile Forms Help Your Business? McKinsey used the term “fast lane” RPAs for lightweight apps that can be scaled across all business sizes and re-used within a variety of business contacts. Mobile forms are a great example of this type of tool, addressing the issues with paperwork, while also structuring communication needs across a wide span of industries, departments, and employee types. With mobile forms, clipboards of paperwork and manually-written emails can be replaced by streamlined entry into a custom business form via a mobile device. Because this business data is structured within the app, the submitted data can be automatically synced across your business technology to update client records, send notifications and more. The technology is flexible and can be used to improve and automate communication tasks such as timesheet submission, project updates, or automated receipts. Device Magic and GoFormz are two leading providers of mobile forms, each offering a solution to help you digitize your business’ paperwork. However, there are significant differences in the mobile forms products offered by the two providers. 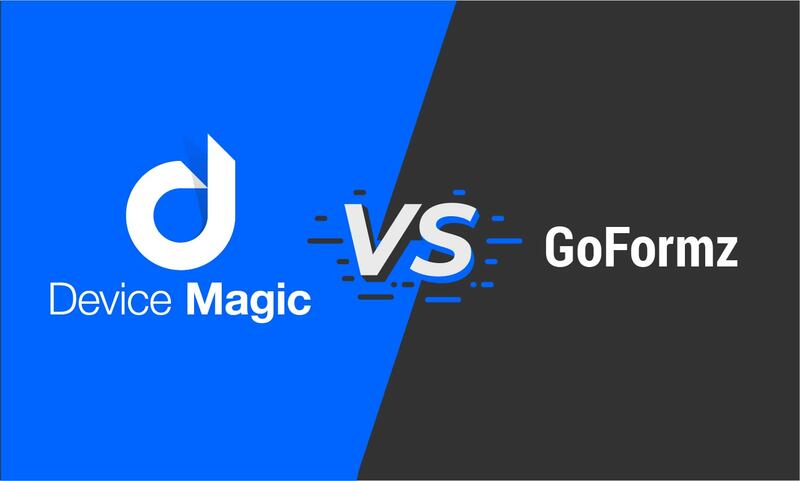 In this point-by-point comparison, let’s explore the differences between Device Magic and GoFormz so you can choose the best solution for your business. Both Device Magic and GoFormz offer a wide set of business tools to help you streamline and automate your operations. This includes structured data collection in multiple formats including text, photos, sketches, and more, as well as offline access for when you’re out of range. In particular, each app offers automated workflows so that when information is entered into the app, an entire automation sequence can be launched. For example, with both apps, it’s possible for a driver’s completed transportation report to automatically initiate a customer receipt email and notify a supervisor. However, you may encounter variable situations where a supervisor only wants to be notified about a failed inspection report or a purchase order only needs to be approved if it’s over a certain amount. While GoFormz doesn’t have the functionality to automate these requests, Device Magic offers conditional destination rules that let you fully customize your automation to meet the needs of your business. Additionally, there are differences in the integrations built into each app. 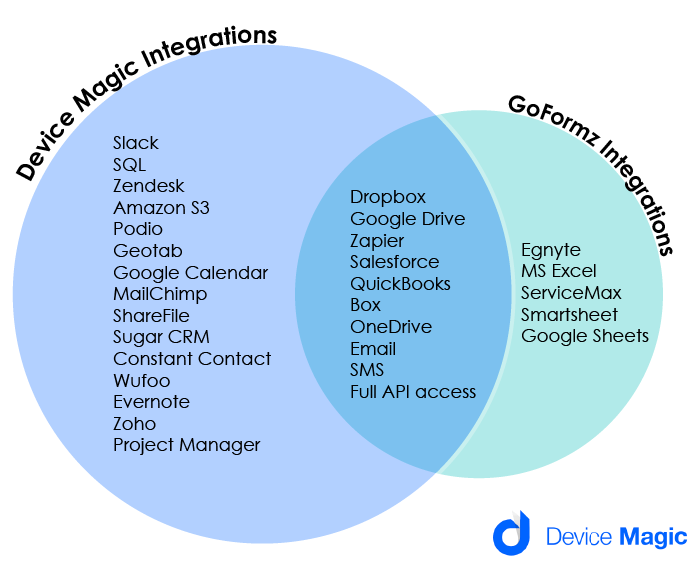 Both Device Magic and GoFormz integrate with Dropbox, Google Drive, Zapier, Salesforce, QuickBooks, Box, OneDrive, email, SMS, and have full API access. Only Device Magic integrates with Slack, SQL, Zendesk, Amazon S3, Podio, Geotab, Google Calendar, MailChimp, ShareFile, Sugar CRM, Constant Contact, Wufoo, Evernote, Zoho, and Project Manager. Only GoFormz has direct integration with Egnyte, MS Excel, ServiceMax, Smartsheet, and Google Sheets. Both annual pricing and month-to-month pricing are available on each platform. In this comparison, we’ll compare the annual rates of Device Magic and GoFormz. For entry-level businesses, GoFormz has a bottom-tier plan with a monthly rate of $15 per user; however, functionality is limited to basic email notifications and select functions. Many businesses start with a mid-tier plan. Device Magic’s Standard Plan and GoFormz’ Advanced Plan both have a monthly rate of $25 and offer integration tools, reporting functions, and more. In the next service tier, Device Magic is priced 32 percent lower than GoFormz with Device Magic’s Advanced Plan costing $34 per device per month, and GoFormz’ Premier Plan costing $50 per user per month. Both providers add additional integrations to these packages. GoFormz adds user groups and phone support, both of which Device Magic offers to lower tier subscribers. GoFormz also adds limited API access, and Device Magic adds JSON submission and secure transmission tools including HTTPS, TLS, and SFTP. Both platforms also offer an Enterprise Plan for large businesses, and with GoFormz, the rate is $99 per user per month. Device Magic’s enterprise solutions are customized based on the business’ needs, and the plans include a wide set of advanced functions. For example, users have SSO functionality, full API access, the ability to white label, XML data submissions, a web app, and even more integrations. What do reviewers and users think about the Device Magic and GoFormz mobile forms apps? Mobile forms are an easy-to-implement solution for businesses that want to reduce overhead, add automation, and save employee hassle. While both Device Magic and GoFormz offer strong solutions, Device Magic has been a proven leader for its strong set of integrations with business apps and its advanced functionality at a low cost. In fact, Device Magic’s Advanced Plan is priced 32 percent lower than GoFormz’ comparable plan. Plus, Device Magic has been selected as a top solution for solving the communications gap between field service workers and business staff. Learn more about Device Magic to find out how you can save administrator hours and lower operational costs. Start a trial today and start building custom forms for your organization.